A few weeks ago Campbell House docent Tom Gronski and I returned from a 2,500 mile trip West, visiting the important sites of Robert Campbell and Rocky Mountain fur trade. Red Rocks Canyon on the road up to the South Pass through the Wind River Range of the Rockies. 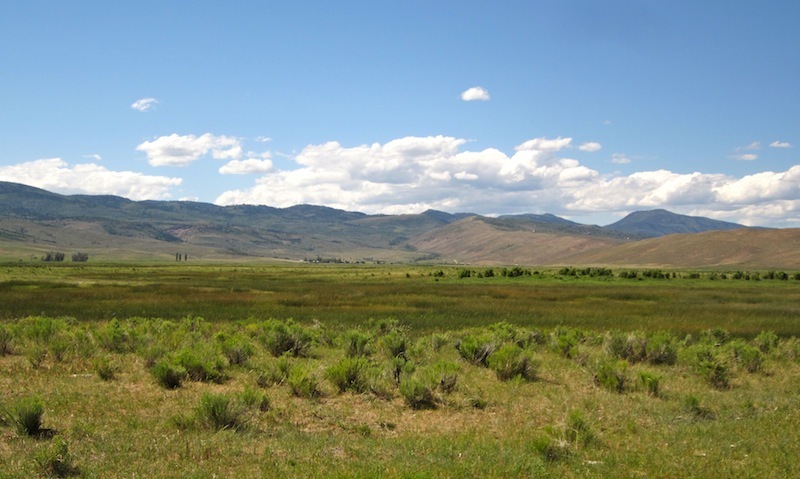 We followed the route of the Oregon Trail, which had been blazed by Campbell and other mountain men and fur traders during the 1820s and 30s. 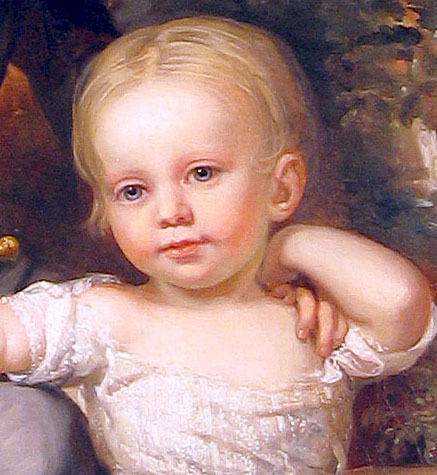 Our first stop was at the Joslyn Art Museum in Omaha, Nebraska. 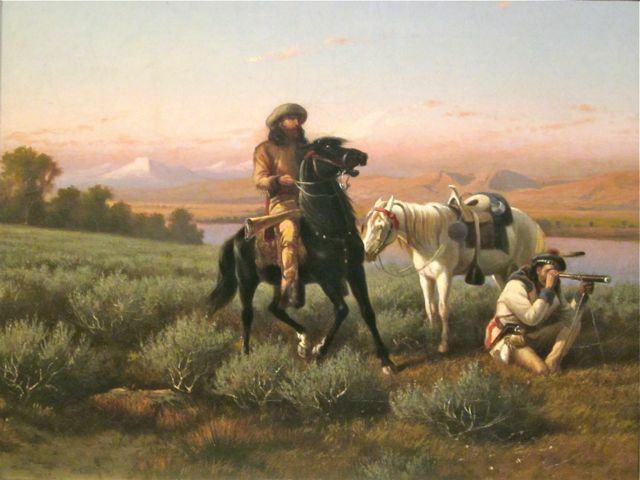 The Joslyn holds one of the most important collections of art of the American West, including works by Karl Bodmer, Alfred Jacob Miller and George Catlin. 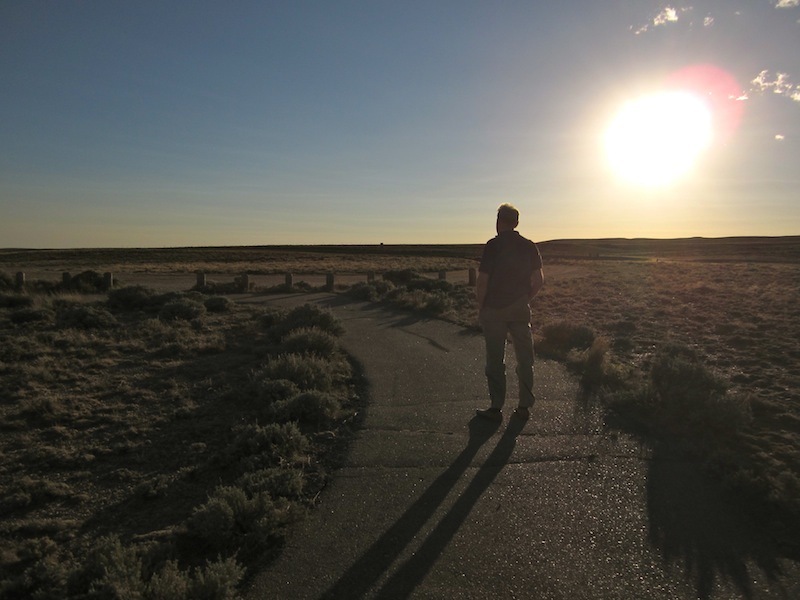 Following a 500-mile drive along the Platte River through Nebraska we arrived at Fort Laramie, where we met Alan McFarland, Robert Campbell’s g-g-g-grand nephew, fresh off the plane from his home in Northern Ireland. 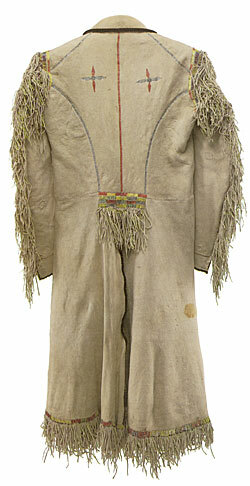 Alan has a special interest in his uncle’s career in the fur trade and has made numerous research trips to America. 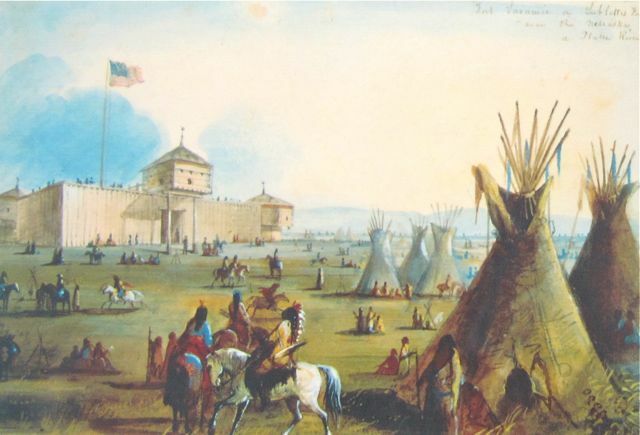 Fort Laramie was the perfect place for our meeting because Campbell and his partner Bill Sublette founded Fort Laramie (originally called Fort William) in 1834. 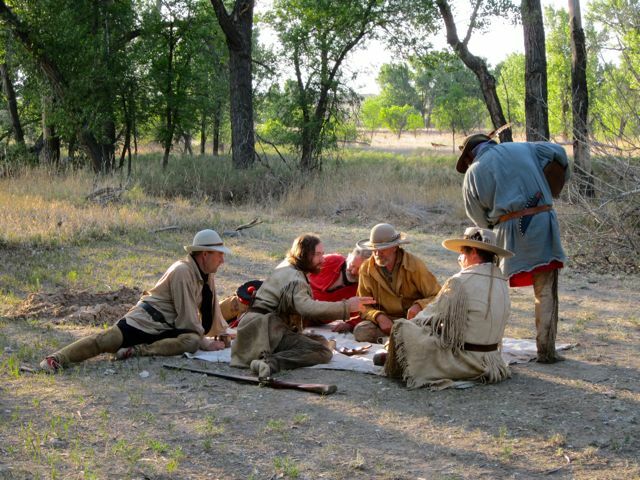 At this National Historic Site we were able to view an authentic fur trade encampment recreated by members of the American Mountain Men. 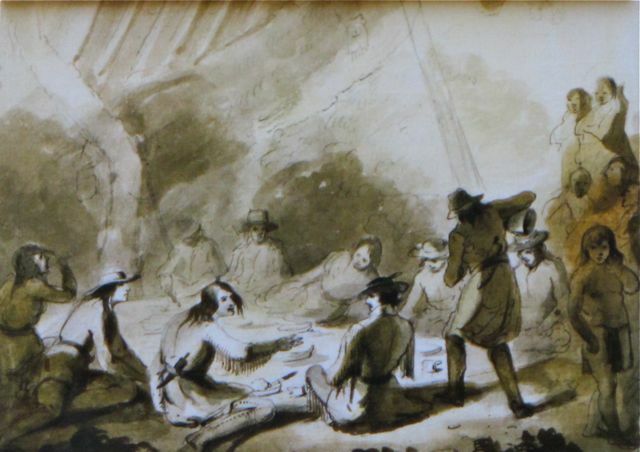 The group later created tableau vivant from one of Alfred Jacob Miller’s artworks depicting a fur trade camp. 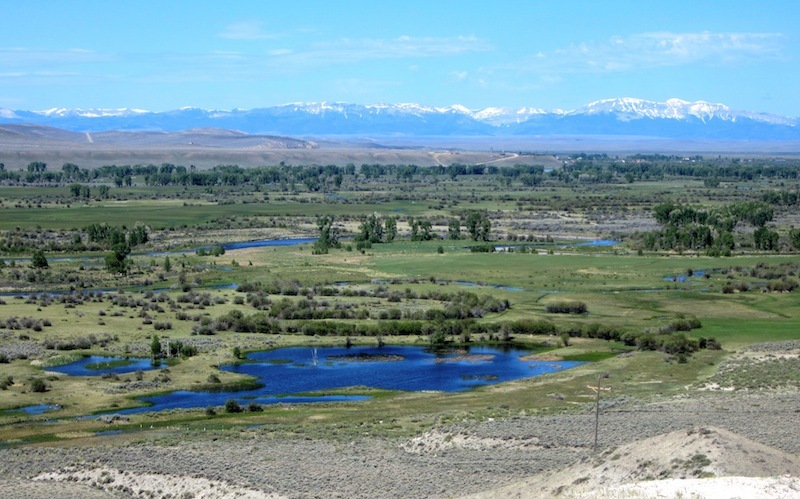 A little further west we followed the Sweetwater River across Wyoming towards the Wind River Mountain Range and the South Pass. Bill Sublette was the first person to take a wagon this far into the Rocky Mountains in 1830, setting a course for thousands that would follow the Oregon and Mormon Trails. The next few days were spent in the vicinity of Jackson, Wyoming where we visited most all of the sites of the Rocky Mountain Rendezvous. The highlights included visits to the Museum of the Mountain Man where we were able to see some original Campbell letters and Pierre’s Hole, site of the 1832 Rendezvous and subsequent battle. 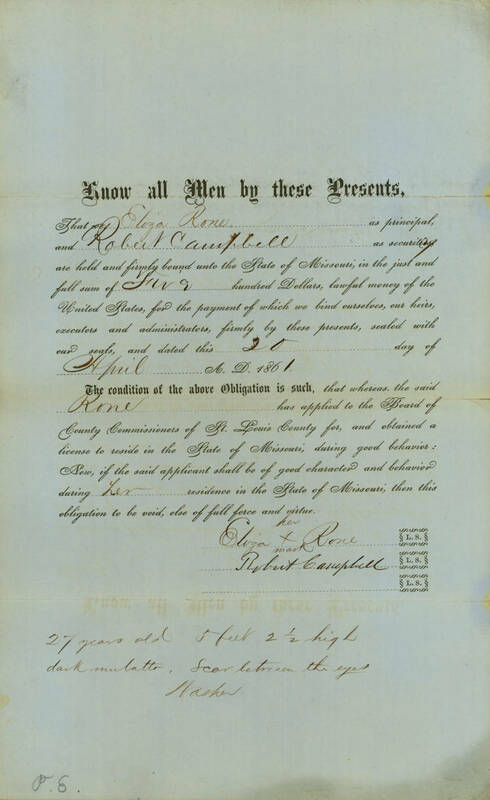 Campbell heroically saved his friend Bill Sublette’s life during the battle as recounted by Washington Irving in the Adventures of Captain Bonneville. Our trip ended with visits to other Rendezvous sites at Bear Lake, Cache Valley and finally Fort Bridger. Enjoy the pictures and follow us West! 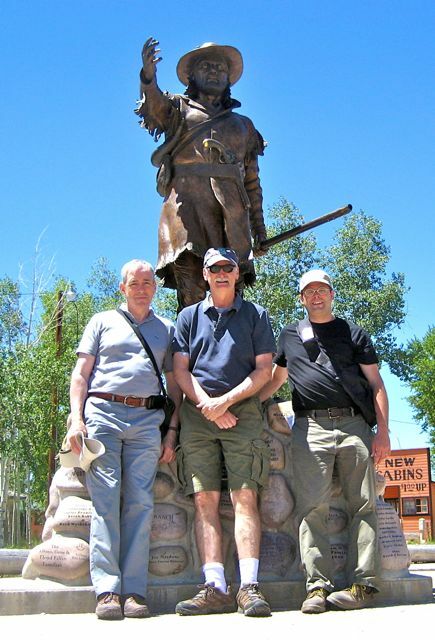 The travelers in the shadow of the legendary Jim Bridger at Fort Bridger, Wyoming. 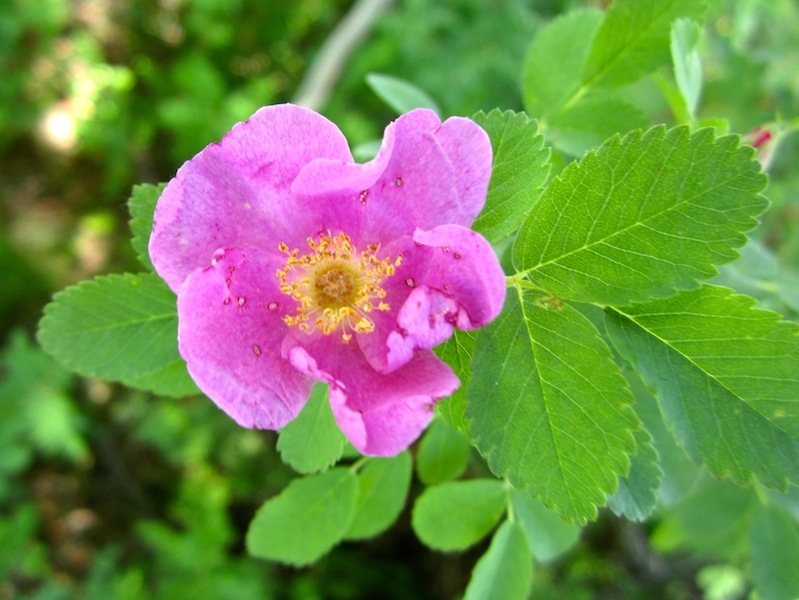 Wild Rocky Mountain rose at Fort Bridger, Wyoming. 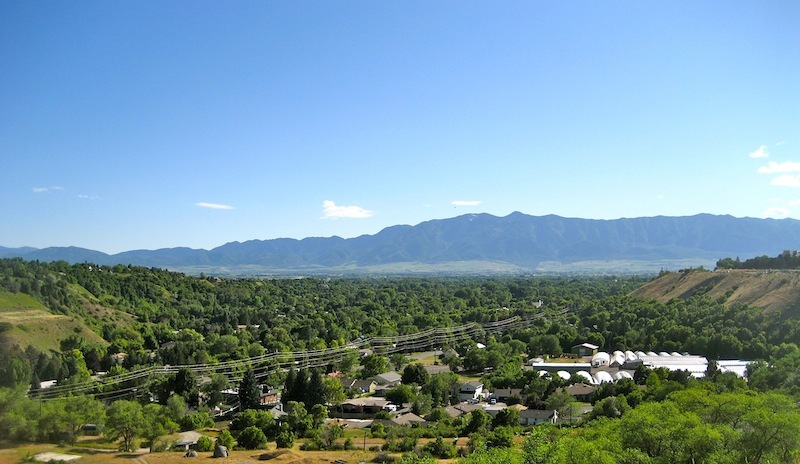 Cache Valley, Utah is the home of the city of Logan and was the site of Robert Campbell’s first Rendezvous in 1826. 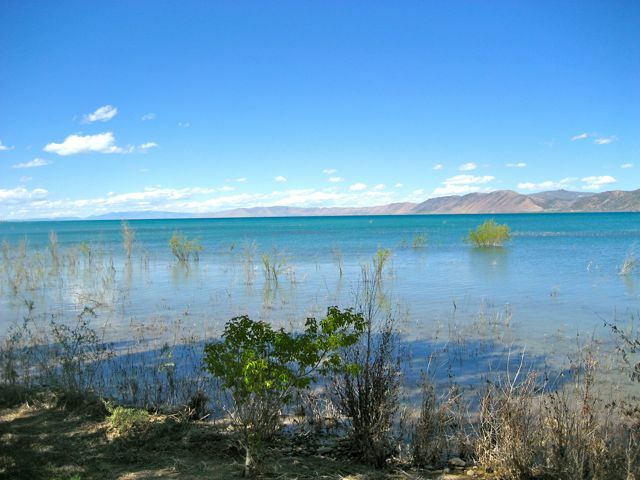 The south end of Bear Lake showing the site of the 1827 and 1828 Rendezvous. The etherial blue Bear Lake, called the Caribbean of the Rockies was the site of two Fur Trade Rendezvous. 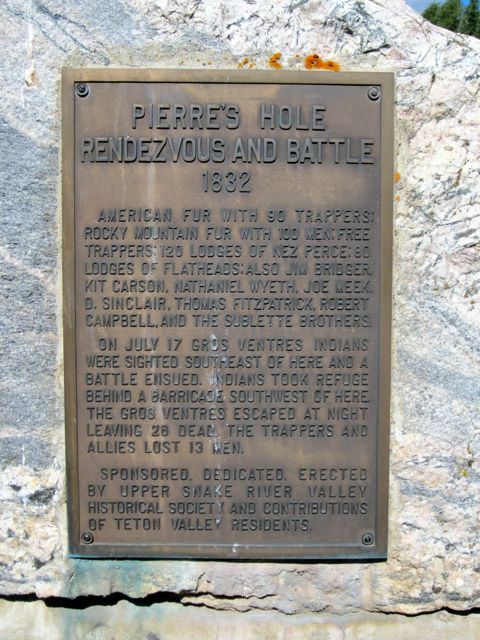 Historical Marker in the Teton Valley describing the 1832 Rendezvous at Pierre’s Hole. 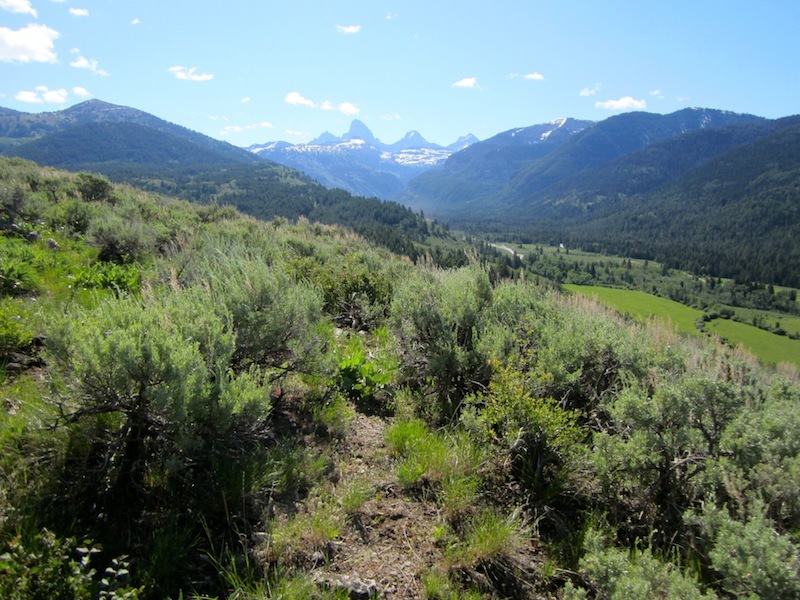 The Grand Tetons overlooking Pierre’s Hole. 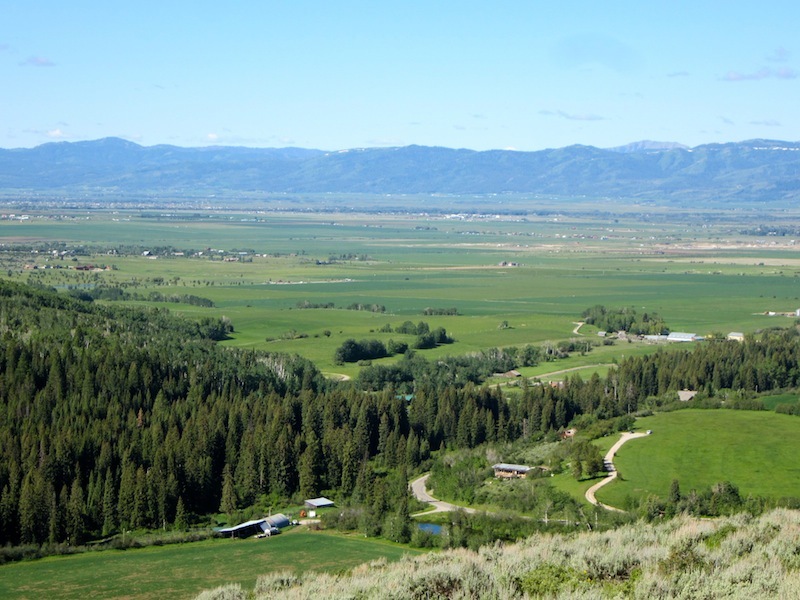 The green valley of Pierre’s Hole is called Teton Valley today. 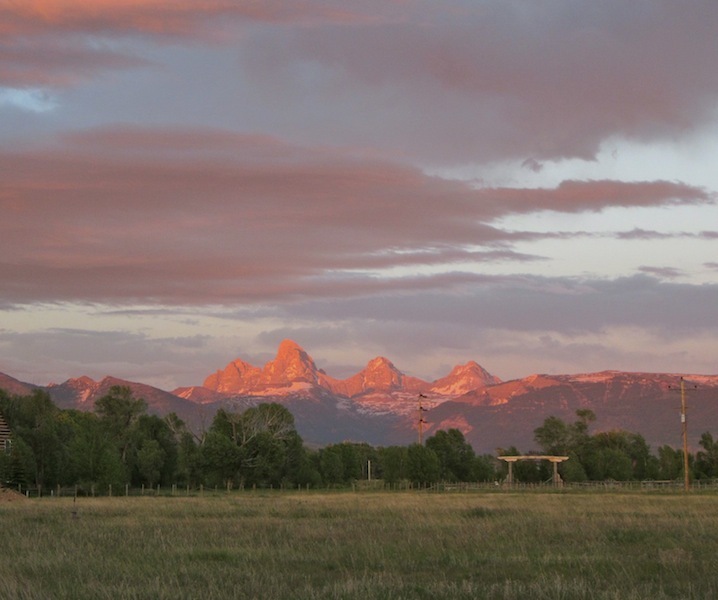 Sunset on the Grand Tetons at Pierre’s Hole in eastern Idaho. 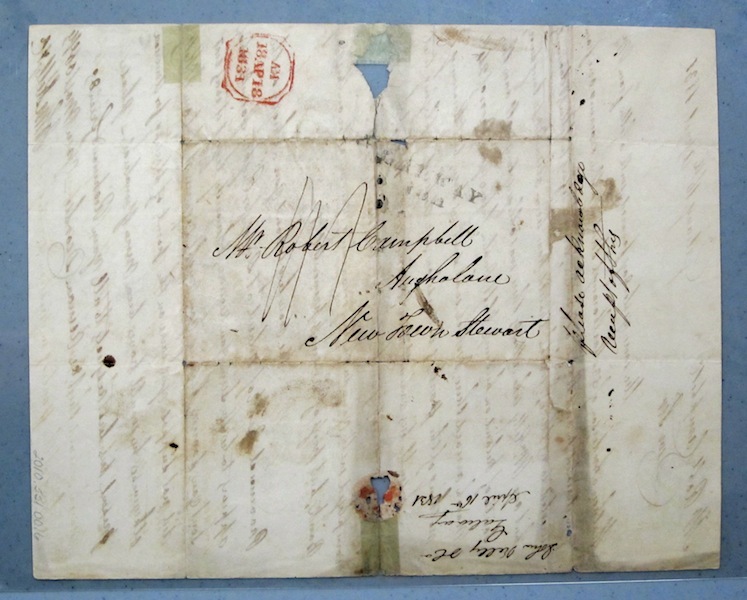 A Robert Campbell letter housed at the Museum of the Mountain Man in Pinedale, Wyoming. 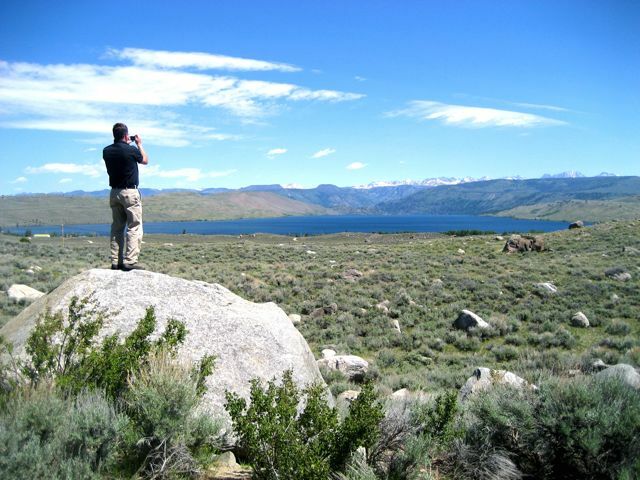 Getting the perfect photo of Stewart Lake in the Wind River Range of the Rockies. 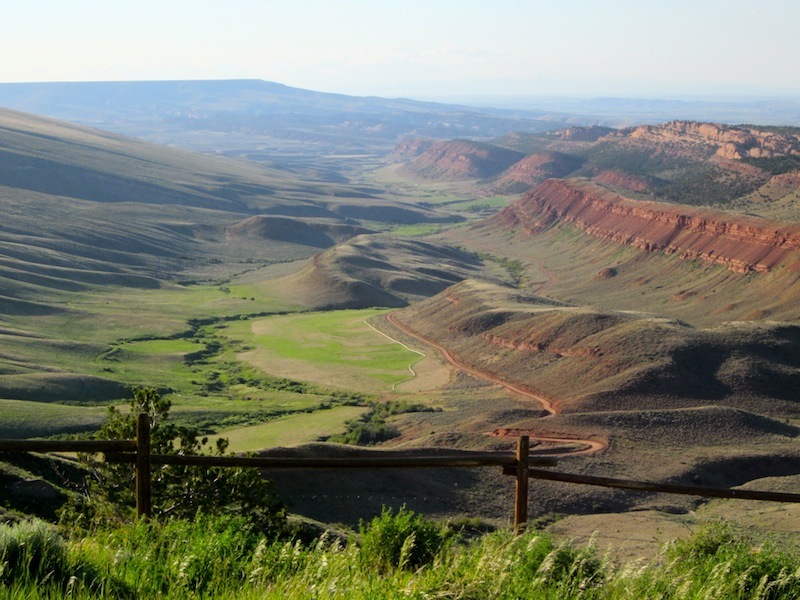 The beautiful Green River Valley, site of the Rendezvous of 1833, 1835-37, and 1839-40, some of which Robert Campbell attended. Alan McFarland contemplating the trail over the South Pass. 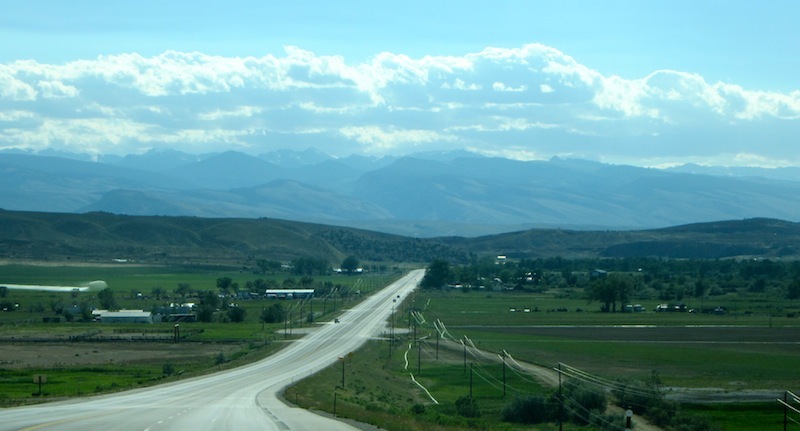 Approaching the imposing Wind River Mountains in western wyoming. 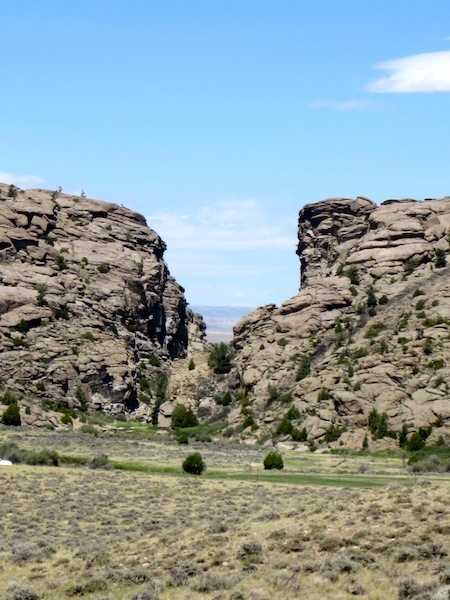 Devil’s Gate, a rock outcropping that is bisected by the Sweetwater River in central Wyoming. 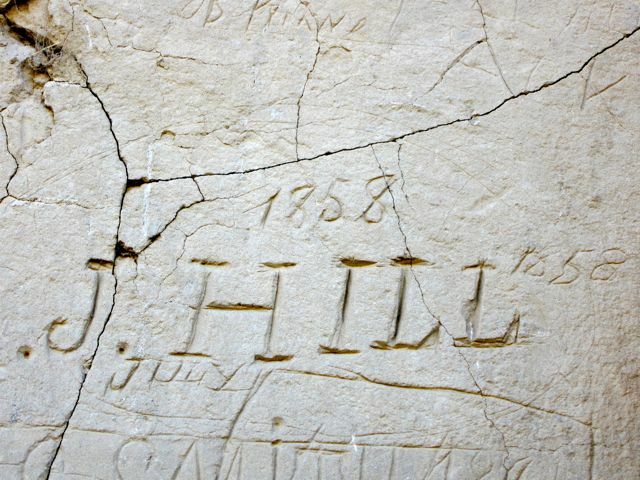 Native americans, western explorers, fur traders and pioneers carved their names in a limestone cliff face called Register Cliff near Fort Laramie. A tableau vivant of Miller’s painting—note the same poses as in the previous images of the painting. 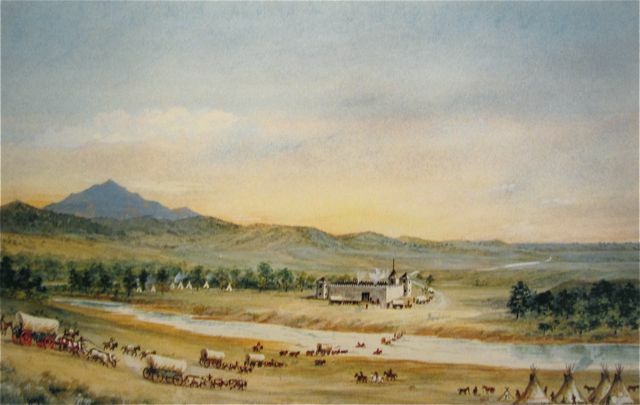 Alfred Jacob Miller’s watercolor showing a fur trade encampment at Fort Laramie in about 1837. 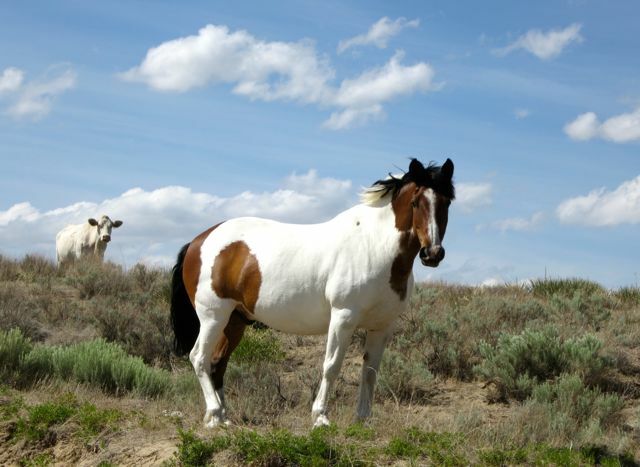 An artistic shot of a wild horse near Fort Laramie. 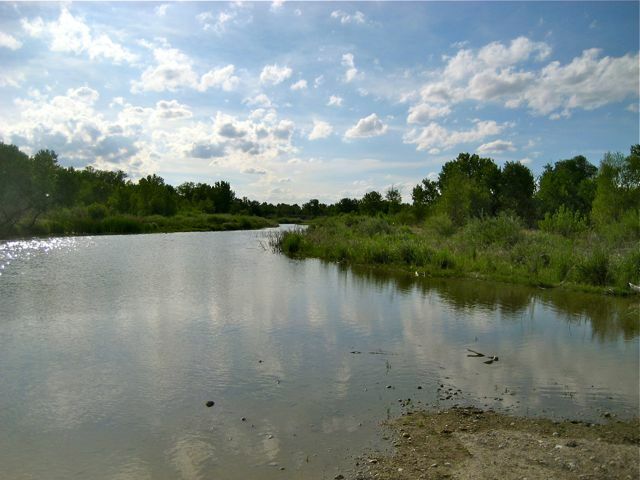 The peaceful junction of the North Platte and Laramie rivers. Thousands of pioneer wagons crossed the rivers near this spot. 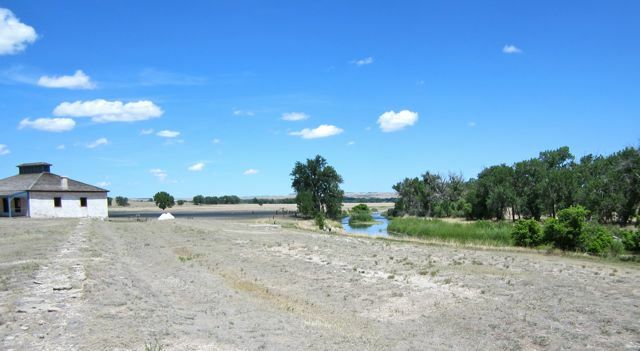 Old parade grounds at Fort Laramie showing the Laramie River. Fort William as painted by Alfred Jacob Miller in about 1840. 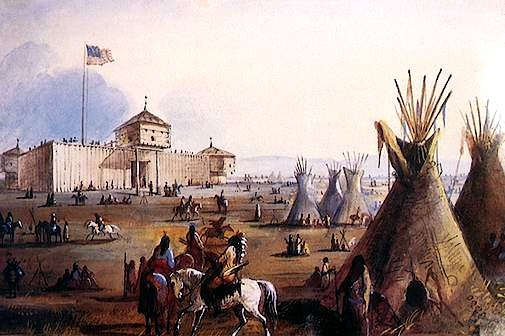 The U.S. Army changed the name of the site to Fort Laramie in 1847. A depiction of Fort William as it was built in 1834 by Robert Campbell and his partner Bill Sublette. At the junction of the Laramie and North Platte rivers the fort became an important stopping point on the Oregon Trail. 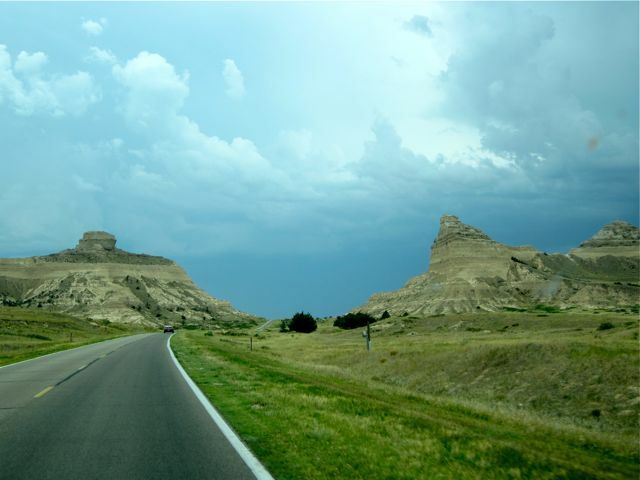 Following the Fur Trade and Oregan Trails west through Scott’s Bluff in far western Nebraska. A thunderstorm was brewing. 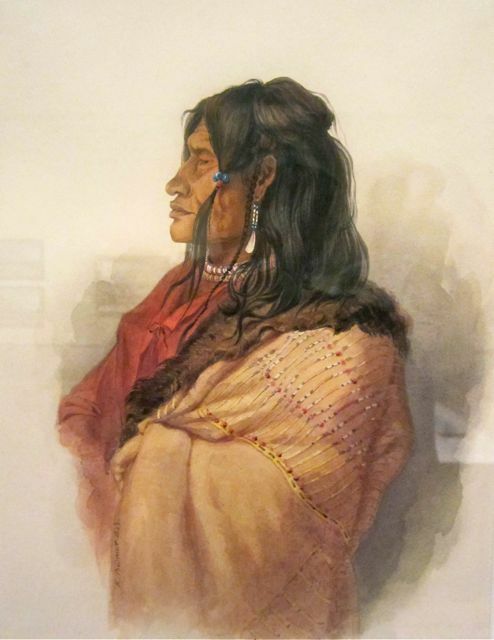 A superlative depiction of a Native American by Karl Bodmer, circa 1833.